These are the best people I have ever met. They are smiling most of the times. Make travelling short distances a pleasure ride. Travelling on these cycle-rickshaws makes me feel like I am aboard a convertible... A poor-man's convertible is a cycle rickshaw. What a profound thought... hmmm hehehe. Next time you want a rickshaw please don't bargain with them. These men deserve every rupee they demand. Hey, that's a great photo. Simple hardworking people like them should be paid well. Many Indians are so simple and innocent by heart. Nowhere else in the world will a person allow a stranger to click his/her photos so willingly. Well said! Dignity of labour should be well rewarded! I like your commentary. In fact, we have a Chinese children song very popular in Malaysia. 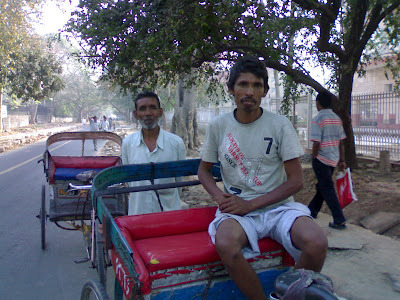 It says about how an old lady offer the rickshaw driver $1 instead of the $0.50 he asked for.